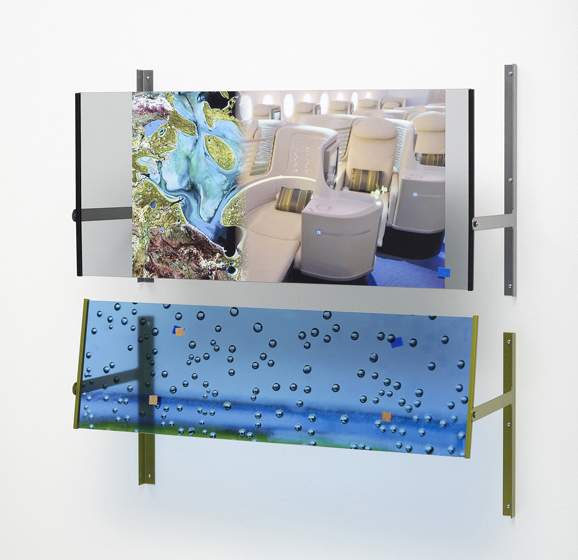 Rhizome | Blog Posts tagged "Hannah Sawtell"
Yin Ho | Mon Apr 16th, 2012 9:58 a.m. The images that you show most often have digital origins, whether combined and assembled into one image, transformed into the surface of a physical object, or edited into sequence as moving image. What is the importance of using digital images (and sound, in the case of your films) as opposed to their analog predecessors? Are your sources always culled from the Internet? If so, do you gather them systematically? How do you refine the selection? The images, textures and surfaces I reconstruct or redeploy are sourced from the ‘contemporary global arcade’. When my work considers the internet, it is to think of it as at once a tool that presents access to a commons, and also a globalised shop, the ‘autocracy of choice machine’... images/sites are bought by multinations, searches made first fall on what the engines have as priority, the majors are all linked, many of the interesting images disappear as websites go down, and there's matters of copyright and how the virtual is policed, etc… with all this in mind and the fact that as I say this, it's outdated, I follow streams to find the right tone for the work. Talking formally, the different pixel or image qualities give a porous or dense cadence to the video or collage. It’s the same with the sound in the videos. It is edited, leaving the glitches at the edge to force the screen to represent the materiality of digital production or cut and paste editing. I use what I have access to...ideas of access are obviously a moot point with regard to global social economics and therefore the possible agency of the collaborator, actor or author.